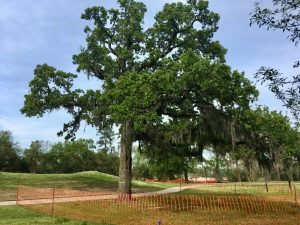 A Galleria-area development group has asked for a federal permit to fill wetlands and dredge and armor streams in Memorial Park in order to build two “earthen land bridges” over Memorial Drive. The project, part of a controversial $200-300 million landscaping plan for the public park, requires the felling of hundreds of trees, including mature pines, digging up and lining the streams with concrete rubble and wire baskets of “rocks,” covering Memorial Drive with concrete tunnels, and relocating playing fields and picnic areas. 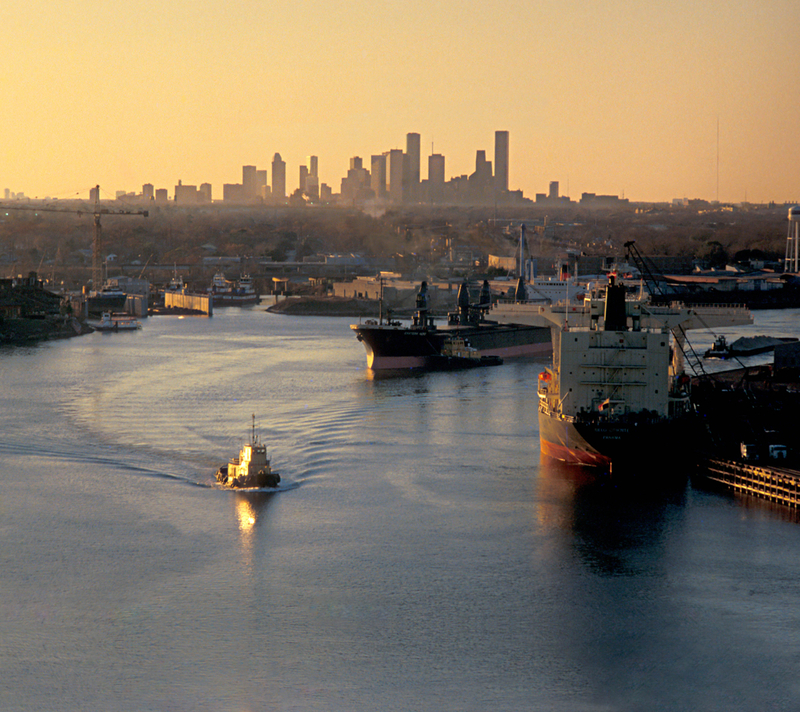 The Harris County Improvement District 1, otherwise known as the Uptown Houston District is a local government corporation composed of property owners and developers and funded by special property tax levies. Its members are appointed by the Texas Commission on Environmental Quality. In 2013 the boundaries of the Uptown District, which is also governed by the Uptown Development Authority or Uptown Houston Tax Increment Reinvestment Zone (TIRZ 16), though they have different boards, was expanded to include Memorial Park, a 1,500-acre semi-forested park on Buffalo Bayou in the center of Houston. 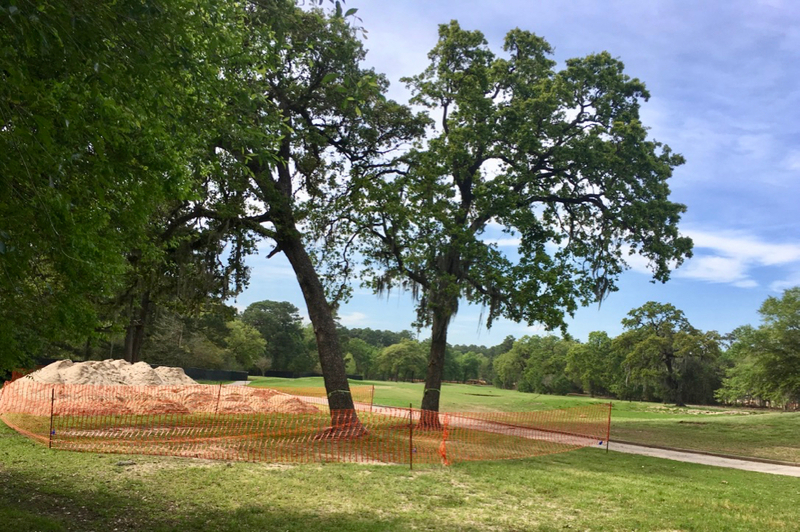 The TIRZ uses local property taxes that would otherwise go to the City’s general fund. 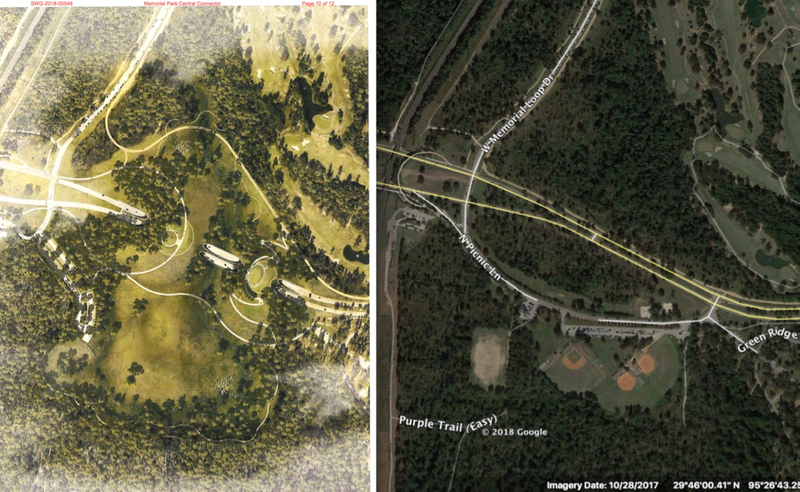 Location of proposed concrete tunnels and “land bridges” over Memorial Drive and same location in 2017. 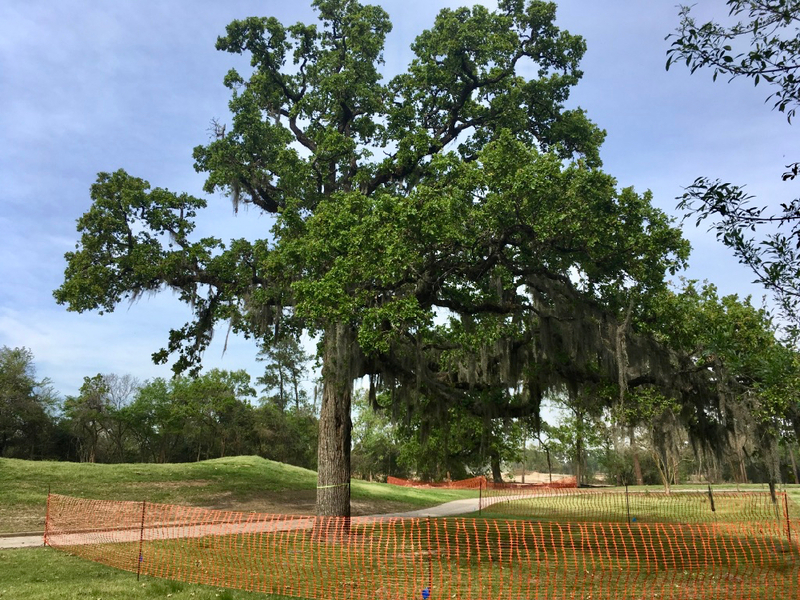 The park, formerly the site of a World War I-era military training camp, is also a State Antiquities Landmark. (See also here.) 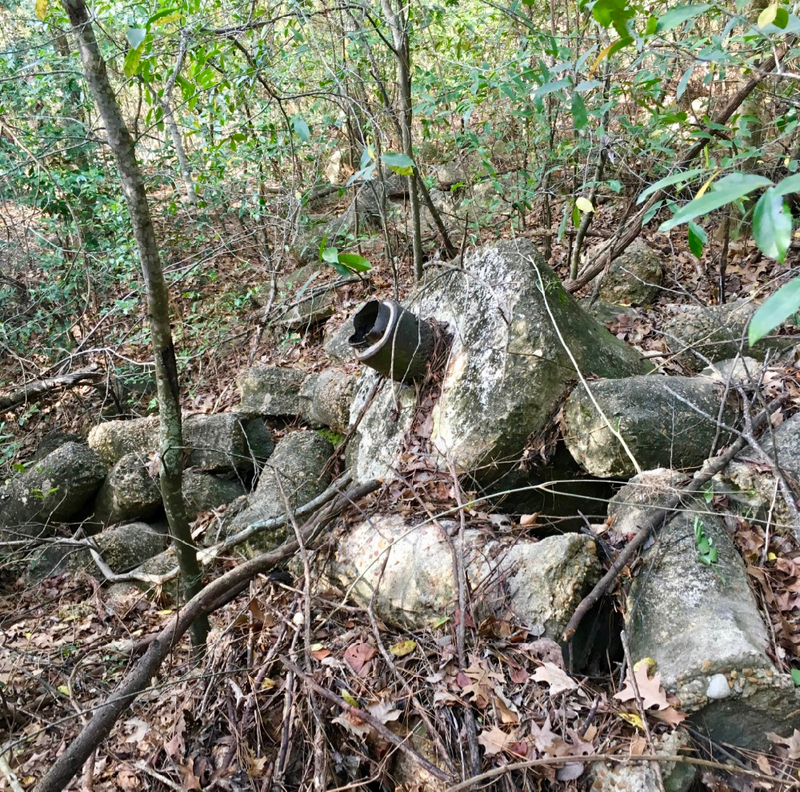 Parts of a small constructed channel connecting the two originally natural though partially altered tributaries appear to be walled with stone possibly dating from that period. 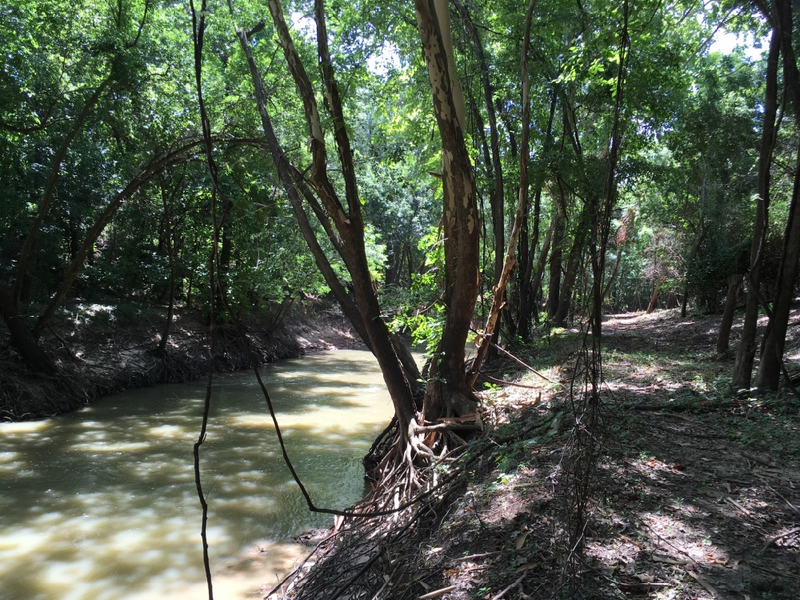 The two tributaries flow through deep wooded ravines lined with lovely dirt paths and empty in Buffalo Bayou. 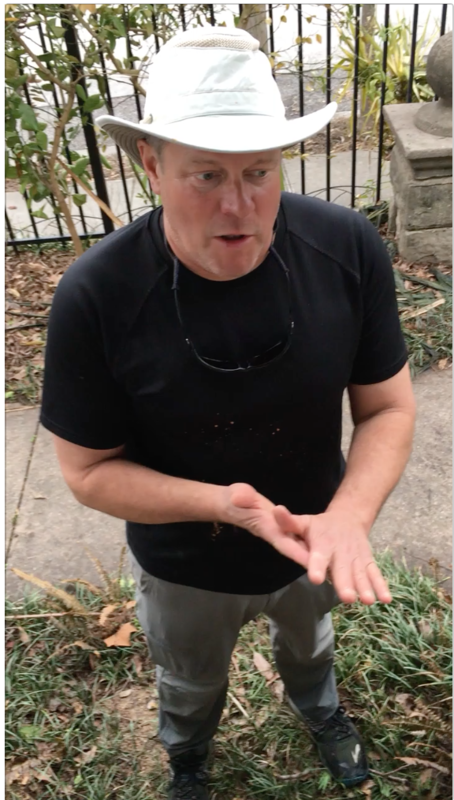 “Rocks,” other than ancient sandstone, are not natural to Houston’s streams. 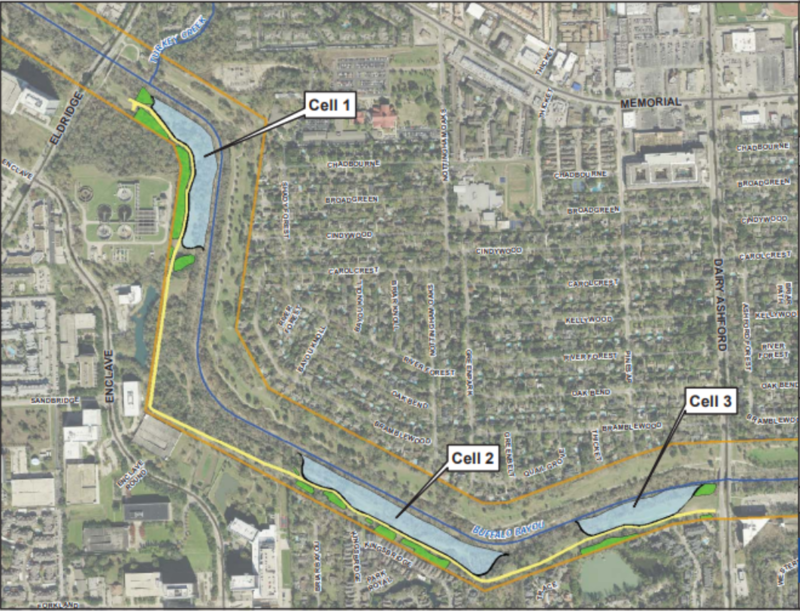 Location of streams, marked in blue, within project area in Memorial Park south of Memorial Drive subject to Clean Water Act because they are tributaries to Buffalo Bayou. 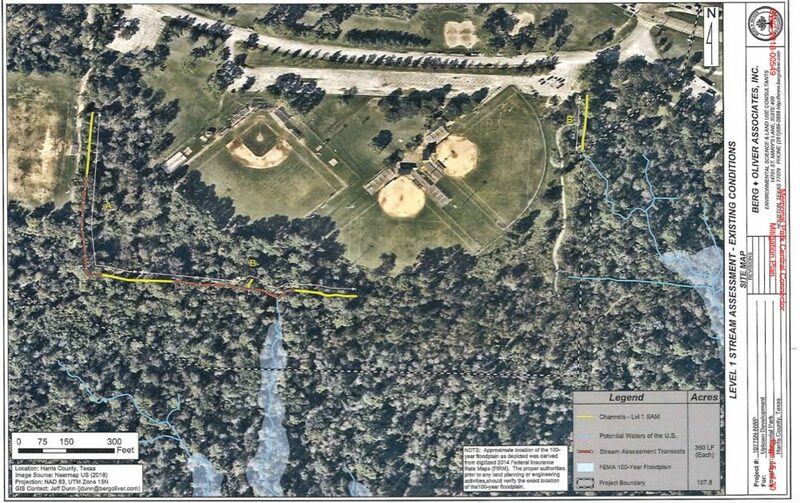 Image from p. 15 of permit application mitigation plan. 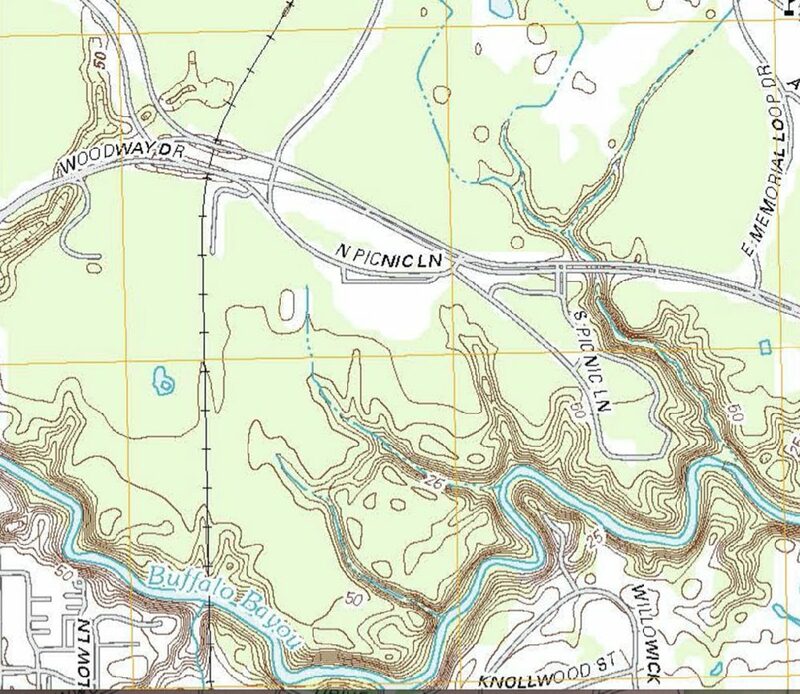 A 2013 topographic map of natural tributaries flowing from Memorial Park into Buffalo Bayou. 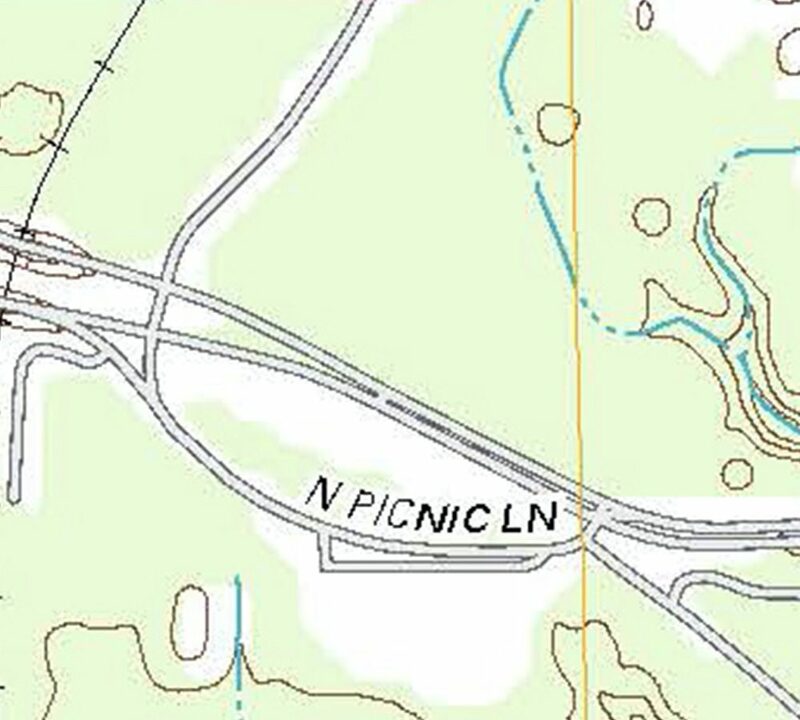 The 2013 topographic map focused on the area of proposed land bridges and "re-established" streams. 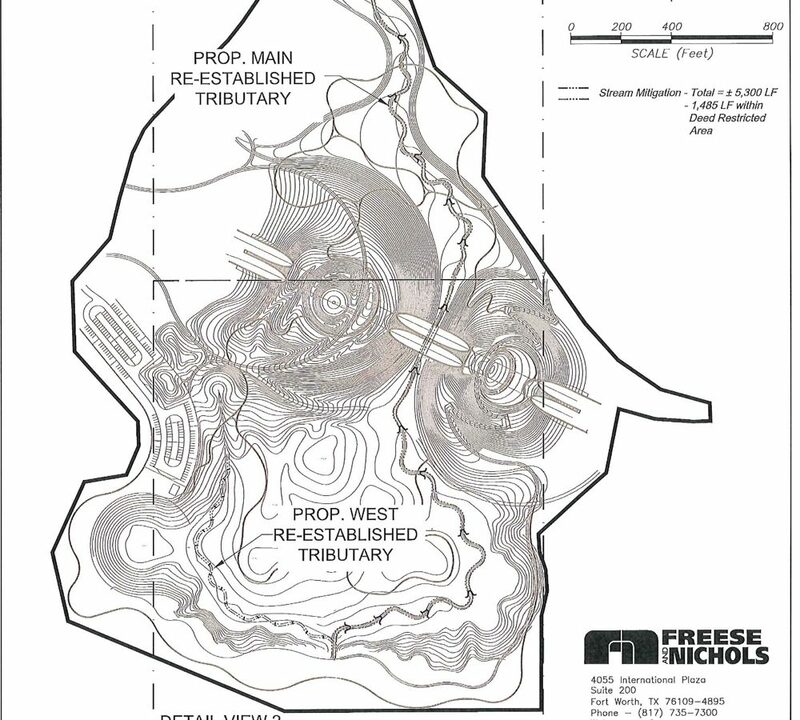 Overview of the so-called "main" and "west" tributaries within the project boundaries. Image from page 24 of the permit application mitigation plan. 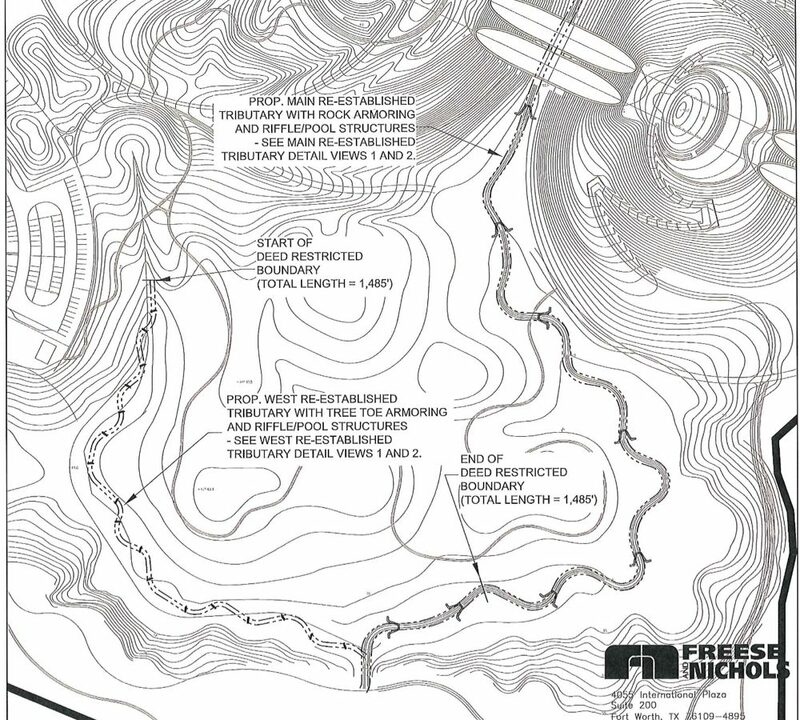 Plans for armoring the two streams with rock, gabions, and toewood. From page 26 of the permit application mitigation plan. 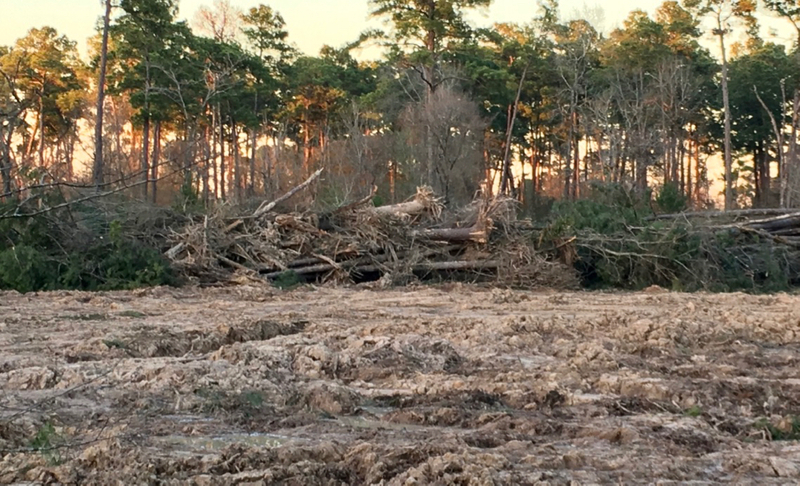 The Improvement District last week filed an application for a permit from the US Army Corps of Engineers, which enforces the federal Clean Water Act. 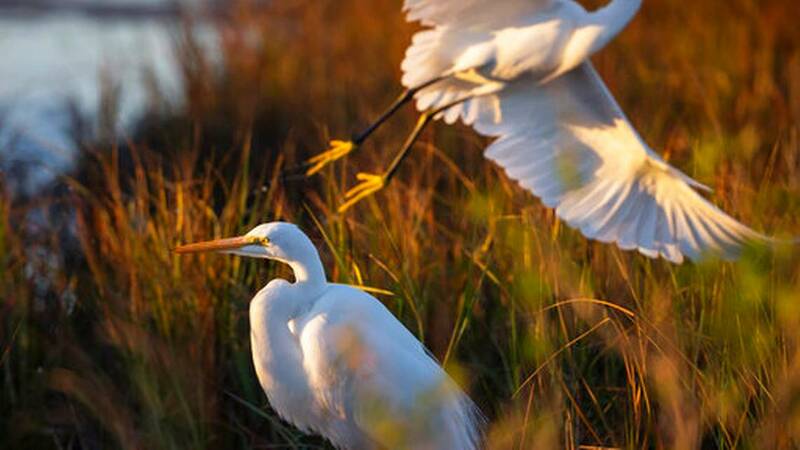 The Corps is seeking public comment on the permit application, including on whether a public hearing should be held. The public has until April 4 to comment. See below for how to comment.